Ansonia Clock Co. hanging clock, "Fulton", ca 1914. This gallery is a 30 day, time only model. Unusual to find this model in 30 day. The double spring movement is running. 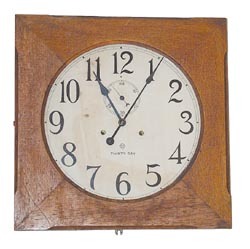 Fine old 19 inch square, oak case with the original finish. The hinged front opens left to right. Original door latch. Old paper dial with seconds, has slight staining. Ly-Ansonia No.686.